I’m back! And there’s no way I’m going to write enough posts this month like I wanted in my last post. You live and you learn I guess. 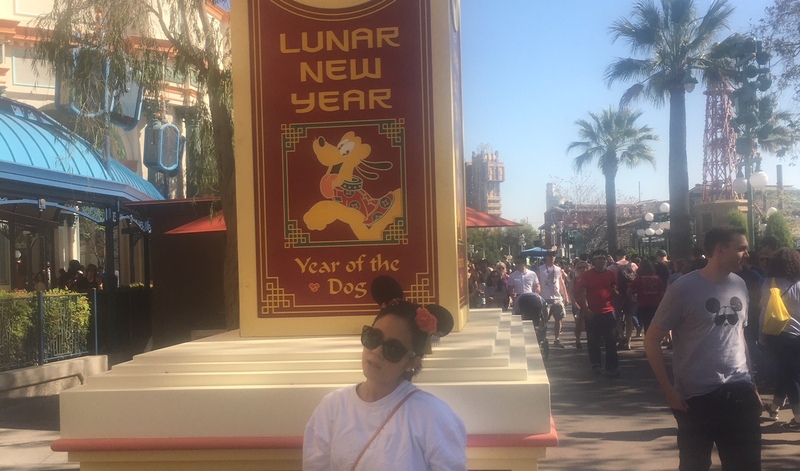 I know I’m a little bit late, but I’ve been meaning to write a post about the Lunar New Year Celebration at Disney California Adventure, but of course, I “haven’t had time.” I’ve never been to LNY at DCA before, and there isn’t a lot of scholarship out there about it. I think it might be something that grows and grows with each passing year. I walk in to the park and am immediately greeted by park maps featuring Mushu and Mulan. I am going to keep these for a long time longer than I should. I have no reason to keep park maps yet for some reason I like to hold onto them. I’m just a sentimental person and I attach arbitrary sentimental value to arbitrary things okay? There are no other Asian things for the rest of my walk through the main street of DCA, other than a quarter of the tourists there. I kept seeing packs of these very fab Japanese girls in truly amazing park outfits everywhere in the park. There must have been some sort of all-girls field trip that brought them there. We walked directly to the Lunar New Year area. We didn’t need to waste any time hustling to fastpass lines because I paid the extra $10 each for MaxPass and we got our fastpasses for Radiator Springs right away. Guests are immediately greeted by a large arch/banner announcing Lunar New Year and the Year of the Dog. It’s cute that they used Pluto for their symbol for the year of the dog, but it makes me wonder whether they would use more obscure characters for years that have rarer animals. I.e., I was born in the year of the horse. Who are they going to use for that? The horse in Mulan? Probably. There are food stalls for 3 different countries, presumably those that celebrate LNY: China, Korea, and Vietnam. We immediately get XLB from the China stall. I also got a passionfruit iced tea lychee tapioca drink which tasted very good for the first 5 minutes then I crashed from the ungodly amount of sugar that was inside it. The XLB was better than I expected but obviously nowhere near DTF or ROC quality XLB. It was also around $7 for 3 pieces which is pretty extreme. I ended up going back to get more though. Andrew and I also shared a Banh Mi that they sold in the Paradise Garden Grill area. It took forever to come out and it was just ok. Obviously. I think the LNY event was a big hit because the park offered a lot of freebies. They had the Cerritos Chinese School come in and write calligraphy for you on pieces of red paper for free. They also had free lantern-making and free Mickey ears that you could write your wishes on and hang up on a pole (or, keep for yourself for no other reason than that it’s free). I didn’t end up doing any of these things, because I didn’t feel like I needed to carry any of those things around. I only brought a small bag! Also it looked like the calligraphy people could only choose from a set amount of words, like a tattoo parlor selection. No thanks. The main event for me, of course, was getting a photo with Mushu. I’ve been waiting for this moment ever since I saw the movie. We walked to the little house thing where the Character Greeting line led towards, and I saw Mulan inside taking photos with happy people. I don’t need a pic with Mulan. I have several! Mushu was not there. I asked one of the cast members attending to the Character Greeting what the deal was. They stated that if I got in line at that moment, it would take about 30-40 minutes, and I probably wouldn’t get a photo with Mulan, but with Mickey or Minnie as they were going to rotate in at a certain time. I asked if Mushu is coming and when, and they told me he would join Mulan around 4:30pm. I planned the rest of my day around this and left the Character Greeting area. Around 1:30, we happened to be by the Character Greeting area to get more food, and I saw Mushu was already in there! Those liars!!! This is turning out to be a much longer storytime than I anticipated. I got in line impulsively, and the cast member told me I would most likely be getting a photo with whatever character switched in next. I promptly got out of line and vowed to Mushu that I would return around 4:30. Day passed by, watched the parade, watched the drummers, rode some rides, blah blah blah. We return to the Character Greeting area around 4pm because I just can’t wait and I want to be there early in case the line is really long and I don’t get there in time for Mushu. It’s way too early. We get in line and get through in about 10 minutes. We get a photo with Pluto, just because he’s there. We get back in line. It seems about the same length and also seems like we will get through it in the same amount of time. We wait, I get anxious about going back to the end of the line, and I see several other people are too. No one wants a picture with Pluto! The main difference is that these people are dying for a pic with Mulan, not Mushu. We got back to the end of the line approximately twice. We thought about going for a third time but decided to stick it out. It ended up being perfect timing. Mushu joined Mulan while we were still about 10 minutes away from the front of the line. I actually started getting anxious that he was going to leave before we got to the front! He didn’t. I achieved my goal/dream for the day. I got a selfie with Mushu (without Mulan). Mulan was funny too. When I was taking the selfie, she was like “what about meeeee and tried to get in the pic.” Truly amazing. Anyway, that’s how I got a pic with Mushu. I would advise going to DCA at LNY time, and basically stalk the Character Greeting area or ask a cast member when the character you want is going to be there. They know! Even if they pretend they don’t or can’t guarantee something, they pretty much know. Disney is a fine-oiled machine by now.